Please activate Java script in order to be able to fully use this page. “Lola – Paris”, mon amour! Live, laugh and love in a proud city. Wake up with a smile after dancing through the night, greet the sun across the Seine, head to the boulangerie make-up free. “Lola – Paris” is the interior style for trend-setters with heart, for those who still dare to search and to find – for all who maintain a bit of folly. Flowers from Marché aux Fleurs, Haute Couture on the Champs-Élysées and casual living combine to create the style of the French capital and manage to do so without any airs. 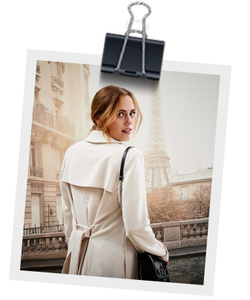 “Lola – Paris” brings the charm, the breath and the chic of the city to the wall. The typical character “Lola” represents the trends from the metropolis of Paris. We would like to take you to the wonderful Paris of “Lola”. Her home is in a small old building in the heart of the city. 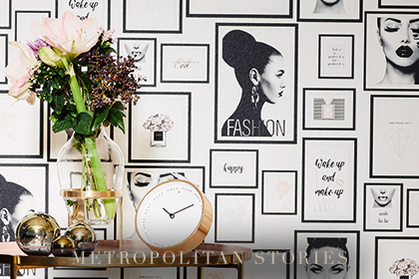 “Lola’s” interior style is modern and sweet, just like her wallpapers. On the one hand, she has wallpapered a sweet floral pattern in soft rose tones, but she also has the courage to contrast this with a stylish picture frame/fashion wallpaper. Lola attaches great importance to fashion, which is also reflected within her four walls. Everything is kept discreet, but carefully chosen. No room for unnecessary bells and whistles. She loves soft rose tones and light gold elements. But what she simply cannot do without are some lovely fresh flowers. These can be found, for example, on the famous Marché aux Fleurs. It smells wonderful and adds the perfect finishing touch to her interior design. “Lola” will soon be taking you through Paris and show you her favourite spots. Something to look forward to! With striking colour combinations, the elegant yet refreshing pattern with its palm leaves turns every wall into a real eye-catcher. Whether invigoratingly bright or elegantly dark, whether matt or with metallic effects – the patterned wallpaper of “Lola – Paris” oozes charm on so many levels. It is in the bedroom where the non-woven wallpaper creates a particularly stunning effect. to ensure perfect interaction with the stylish wallpaper.